Shoulder stand is a mysterious pose. Scholars make an educated guess that it’s been with us since at least pre-modern times. By its Sanskrit name, Salamba Sarvangasana, we can date it only back to 1934, where we read about in Tirumalai Krishnmacharya’s book, Yoga Makaranda. But, if Salamba Sarvangasana is the same pose as Viparita Karani — mentioned in the 15th century Hatha Yoga Pradipika — it has been with us for many centuries. The earliest picture we have of the pose by this name is fairly late — but it looks alot like Shoulderstand (in its “unsupported” form). We see that picture in the March, 1898 New York Herald (Figure 1). The student depicted there learned the pose from Swami Vivekananda (1863 – 1902), or one of his students. 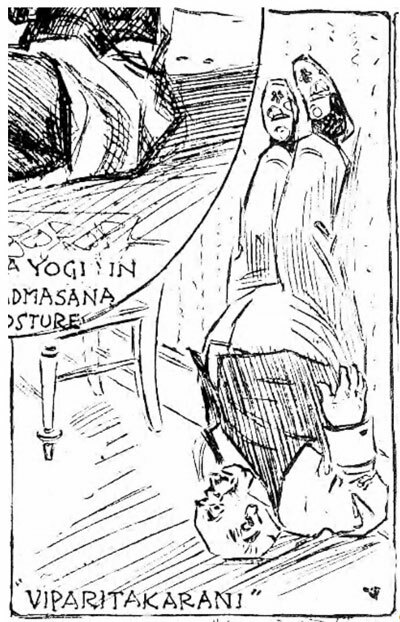 For a long time it was thought that Vivekananda—who came to America in 1893 — didn’t teach asana, but this image and others from this New York Herald article are our main evidence that he did. The article refers to Swami V and was written by his American disciple, Swami Kripananda. We also discover Shoulderstand in Western sources. It is found in the early – 1800s gymnastic system of the famous Swede who invented modern group gymnastics, Pehr Ling (1776 – 1839). In his system, Shoulderstand is called, “Candle,” “Candlestick,” or “Swedish Candle,” and it is still identified that way outside yoga circles — because Ling’s exercises spread throughout the world, being utilized even in Krishnamacharya’s time (1888 – 1989). 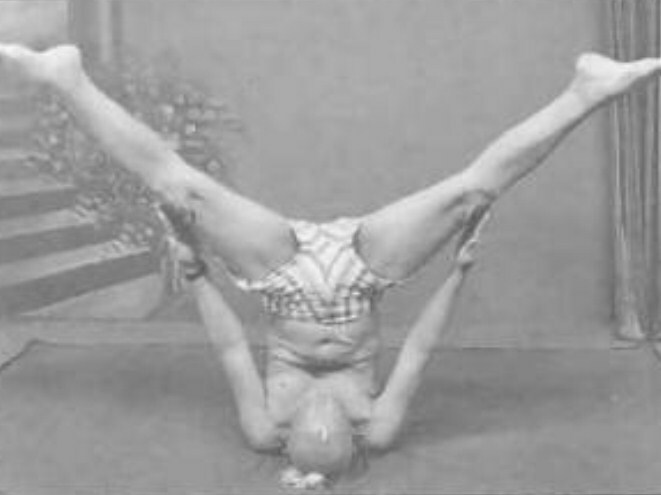 The early system of vinyasa yoga created by the Brit, Mollie Bagot Stack (1883-1935), called “Stretch and Swing” and partly created from poses she learned in India in 1911, also has a form of shoulderstand (seen in Figure 2). Figure 3. 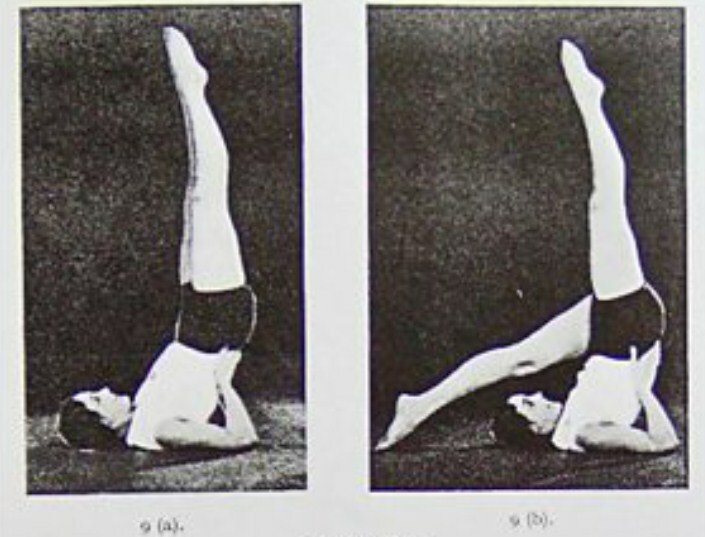 Niralamba Sarvangasana from B. K. S. Iyengar, Light on Yoga, 1966. The fact that Salamba (“supported”) precedes the term, is incidental, for we have the “non-supported” form of the pose — called Niralamba (“non-supported”) — too (demonstrated by BKS Iyengar in Figure 3). When we say Sarvangasana, we mean it affects the whole body, because it “makes” (karani) the whole body “reversed” (viparita) — energetically as well as pragmatically! This general effect of the pose is explained to us in Kundalini Vidya (kundalini science). Viparita Karani makes the “moon eat the sun” as opposed to the other way around. Sarvangasana locks the neck, training the body to handle the power of consciousness (the moon) that flows down from the head, differently. 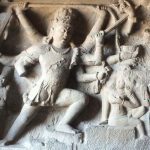 The body learns to block, hold, and channel the power of consciousness that pours down into the human form (like an inverted tree, as the old texts tell us) so that the “sun” — which is prana or lifeforce in the body — won’t wastefully burn it up in mundane activities of perception or action. If the yogi can achieve this blocking or channeling, s/he reserves the force of consciousness for the development of awareness. This understanding is expanded when we point to Sarvangasana’s use of the chin lock (Jalandhara Bandha) as a “net” or “lock” to keep the “nectar” of the “moon” from moving below the neck. In the modern day lore, we have the famous teacher B.K.S. Iyengar’s telling us that Shoulderstand is the “mother” of all asanas. 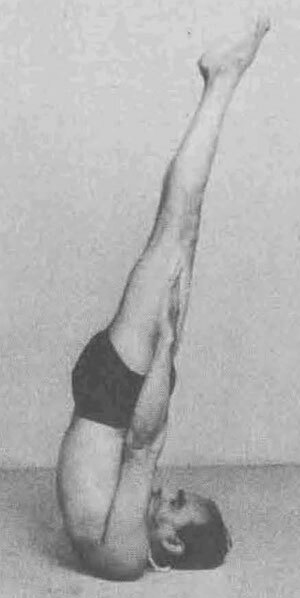 Sarvangasana is contrasted with Headstand (Shirsasana) as the “father” of all asanas. 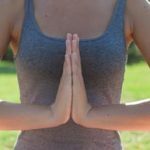 Iyengar’s teacher, Krishnamacharya, took this dualistic coding a bit deeper when he explained that Shoulderstand and Headstand opened up the two main areas of consciousness in our body. Whereas, the brain received stimulation from the pressure of the ground (especially at the point of brahmarandhra at the center of the skull), the heart received stimulus from the driving energy (vigaha) of the chin in shoulderstand (the chin points toward the heart in the pose). Besides its many names, like headstand, it has many variations. In Krishnamacharya’s 1937 book, Yoga Rahasya, tells us that Sarvangasana is good therapy (chikitsa) for bodily health, and adds that sixty-six variations of shoulderstand and headstand exist. In Figure 4, we see K in the radical variation called Niralamba Konasana. Here’s how to do it — briefly! The basic form of Sarvangasana can be seen as a variation of what we call Halasana, or plow—a forward fold done on the back. 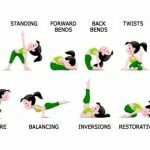 The neck should be warmed up with various bendings and rolls, the hamstrings and back stretched by uttanasana (standing forward fold) and other poses, and preparatory poses like Bridge (Setu Bandhasana) should also be explored. In Iyengar yoga, one lays on folded blankets so that the seamed side provides a little shelf for the shoulders to line up on. The neck hangs off this shelf with the head supported by the floor. The legs are flipped over the head as the arms reach in the opposite direction along the surface of the blanket, interlace at the hands and pull the shoulders toward one another. One actively pushes the shoulders down as the hands unclasp, elbows bend, and palms rest flat on the back as close to the shoulders as possible. Swing the legs vertically into the air and hold them there. Push the inner feet toward the sky following the line of tailbone and flair the toes. Lock your eyes on the dristi (eyegaze point) of bindu — the spot between the eyebrows. Hold for a comfortable amount of time. Return to laying down with control. Do Matsyasana (a mild backbend on the elbows) then take resting pose called Savasana. Shoulderstand is commonly explored as the third to last pose in a yoga class. Explore its subtle physical effects, and Enjoy!